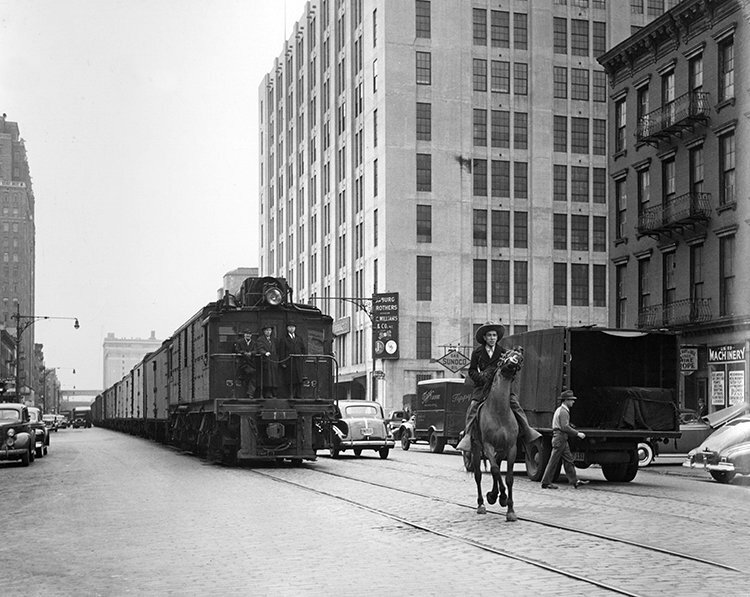 The History of "Death Avenue"
Not just an urban legend, West Side Cowboys rode in front of trains to warn pedestrians and traffic of the oncoming rail. Photo courtesy of Kalmbach Publishing Company. 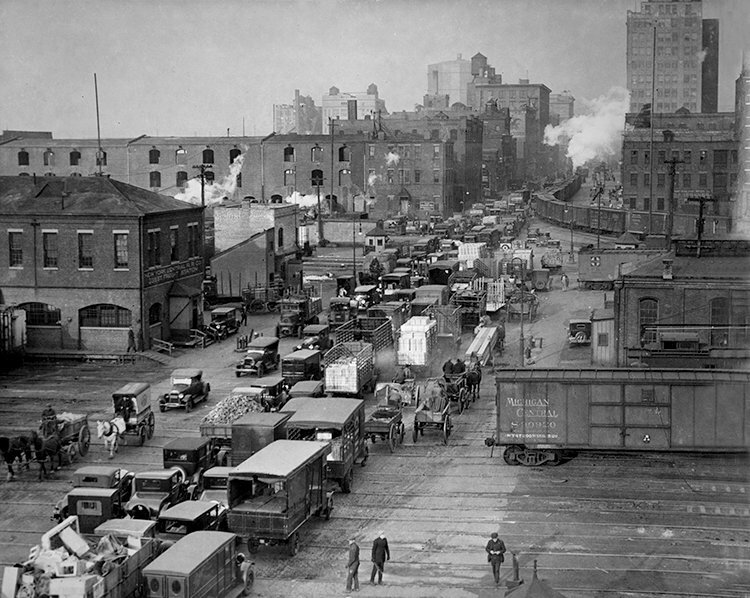 It’s hard to imagine that beneath the calm refuge that is now the High Line there once laid a street so chaotic that it was less-than-fondly known as Death Avenue. For almost one hundred years, the High Line’s predecessor—the New York Central freight line—dangerously plowed up and down 10th and 11th Avenues, leaving people, carriages and cars in its wake. The need for a freight train to serve the factories and warehouses on the West Side was addressed in 1846 but the street-level tracks were not among the city’s best plans. The block-long trains ran through cross streets and traffic, killing and maiming hundreds of people. Problems along the tracks persisted for the entirety of the railroad’s existence, with an 1892 New York World story referring to the trains as “a monster which has menaced them night and day.” By 1908, the Bureau of Municipal Research claimed that since 1852, the trains had killed 436 people. A New York Times piece from the same year reported that in the preceding decade there had been almost 200 deaths, mostly of children. The city did, however, take certain precautions in the 1850s, setting an ordinance requiring a person on horseback to ride ahead of the train, making pedestrians and traffic aware of the train’s nearing arrival. Known as West Side Cowboys, these legendary figures waved red flags and lanterns to warn those on street level. But these urban cowboys could not keep the hazard at bay, and the tracks remained a danger for city residents. In the late 1800s, neighborhood pressure resulted in the tracks further uptown moving below street level. South of Grand Central, however, the trains remained, and various incidents set off a series of protests against the street-level tracks. In 1894, a man who had lost a leg in an accident caused by the train set fire to a portion of the tracks, and in 1897, thieves took to the cars. Finally, in 1908, the death of a seven-year-old boy sparked mass action, as five-hundred people took to the streets to protest the hazardous conditions. In addition to the public discontent, the city pressured the railroad company to change its practices, ultimately refusing to accept the railroad’s licensing fee in 1908. This tactic could not work for long, however, as the railroad was responsible for much of the food supply to the city, running along meat warehouses and grocery outlets. The public remained discontent as deaths continued, and in 1929, the City and State of New York and the New York Central Railroad finally reached an agreement, known as the West Side Improvement Project, to move the rail above street level. These new tracks — the High Line — opened in 1934, running through factories and warehouses to pick up goods, rather than through street traffic. The last train ran along these tracks in 1980. Since then, the rail line has been transformed into our peaceful park, with the terrorizing traffic of Death Avenue the last thing on visitors’ minds as they enjoy a stroll, snack on an ice cream sandwich, or take in summer’s blooms. And while the change is definitely a marvelous one, we can’t say we don’t love watching this West Side Cowboy in action.